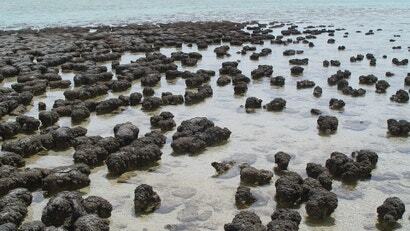 Science has shown that the Earth is 4.5 billion years old. But what about the life that exists on it? Since 2006, we've thought that biological activity in the form of stromatolites — ancient layered geological structures — first appeared here 3.5 billion years ago, and now we have even more evidence to back that up. Many of the differences were associated with inclusions of organic material within the rock. Similar values were found in iron-sulfur compounds that had precipitated out. The large positive values, the authors suggested, are an indication that the original source of the sulfur was probably from the atmosphere, consistent with what we know of its likely composition during the Archean era.